The billionaire philanthropist Bill Gates has told the BBC that the United States "should set a better example" by taking in more refugees. Mr Gates said his home country "had the capacity" to follow the examples of Germany and Sweden, who were "to be congratulated" for welcoming migrants. But he acknowledged that relaxing immigration laws "was not easy". Speaking at the World Economic Forum in Davos, Mr Gates added that governments were dealing with "tight budgets". However, he emphasised that the issue was largely a political one, and that "the total number of refugees is not a world record". 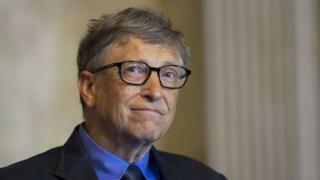 Mr Gates, who runs the largest charitable foundation in the world, said that economic development would stem the tide of migration from some countries. He cited Ethiopia, which used to be a source of refugees, but has now taken in "more than any other African country". This reversal, Mr Gates added, was "partly because we've invested in agriculture, governments had good policies, so food productivity is up very dramatically - over 50% in the last five years". As for those fleeing conflict zones, Mr Gates said the priority should be to get medicines such as cholera vaccines into refugee camps, and to help children living in them continue their education. However, Mr Gates was keen to strike a note of optimism, at a conference that has been weighed down with worries over instability in global markets, the fall in oil prices, and rising inequality. Media captionHow does Bill Gates choose which causes to back? "It's quite amazing, over the last 25 years, that we've cut childhood death in half," he said, referring to the Gates Foundation's work in eradicating disease. "We've got polio, that was crippling over 300,000 children a year, last year it was 70." The Foundation, which has an endowment of over $40bn, is now focusing on stamping out malaria, and despite the "corruption and short-termism" of some governments, Mr Gates said he was confident that his quest will be successful. The global elites in Davos this week have also been concerned about the "fourth revolution" - the increased automation in some industries, which, the World Economic Forum has warned, "will cost millions of jobs and hit women hardest". But Mr Gates was adamant that technological advances are overwhelmingly a cause for celebration. Media captionWhy does Bill Gates think we should be happy in 2016? "It's amazing how many farming jobs we got rid of, he said. "The US feeds itself with less that 2% of the population. That's really a very good thing. "Until every old person is well taken care off, every handicapped kid has round the clock support, we can take labour and do great things with it. "Anything that allows us to make the goods we're making today with less labour, that just gives society more options." Although he cautioned that governments would need to retrain people, and soften the blows to various industries, Mr Gates, who has described himself as an "impatient optimist", said that "innovation is on our side". "Basically, the world is getting better." Davos: What can Formula 1 teach business leaders?